Matching dinosaur bone and black onyx sterling silver his and hers wedding ring set. There are 5 pieces of dinosaur bone inlay and 4 small pieces of black onyx inlay in each of the matching wedding bands. 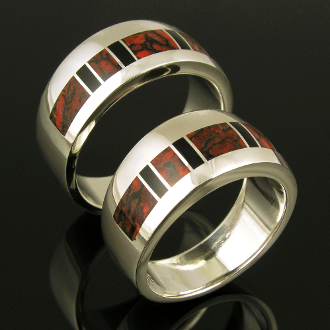 The dinosaur bone inlaid in this his and hers ring set is a nice red-orange celled gem bone with black matrix. The dinosaur bone in these rings came from the Colorado Plateau in Utah and was a living animal during the Jurassic Period around 144 to 208 million years ago. The matching rings are 10mm wide and are stamped sterling silver on the inside. For scale, his ring is shown in a size 10 and hers in a size 6. The rings will be made to order in your ring sizes and can be customized with your choice of inlay materials (some stones may be an upgrade). Orders are usually completed in 4 to 6 weeks. Please include your due date in the "special instructions" box at checkout if you have one. This wedding ring set is perfect for couples looking for non-traditional wedding rings! This set is also available in his/his or hers/hers combinations. Contact me for his and his or hers and hers pricing. These ring are also available in Continuum sterling silver, stainless steel, 14k yellow and white gold for an additional charge. Price shown is for the set in the his and hers combination. The price shown is for women's ring sizes from 4 to 8 and men's ring sizes from 7 to 11. All sizes larger than those will be an additional charge to cover wax work and extra silver. His ring is style M202. Hers is style W115.